We’re approaching glut season. 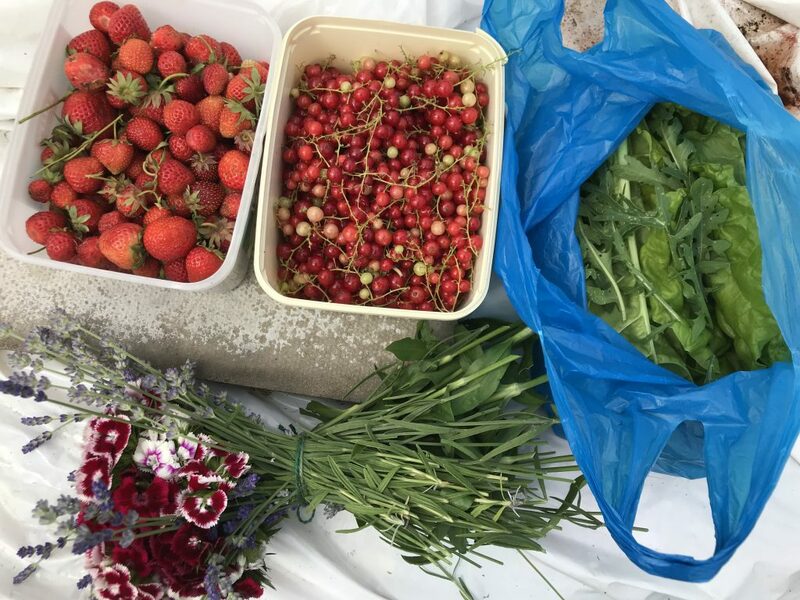 Ten days I go a had a piddling number of quite crappy-looking strawberries, and now I’m picking by the ice-cream-tub full. Same goes for redcurrants and it won’t be long before the blackcurrants, blueberries and raspberries head in the same direction. 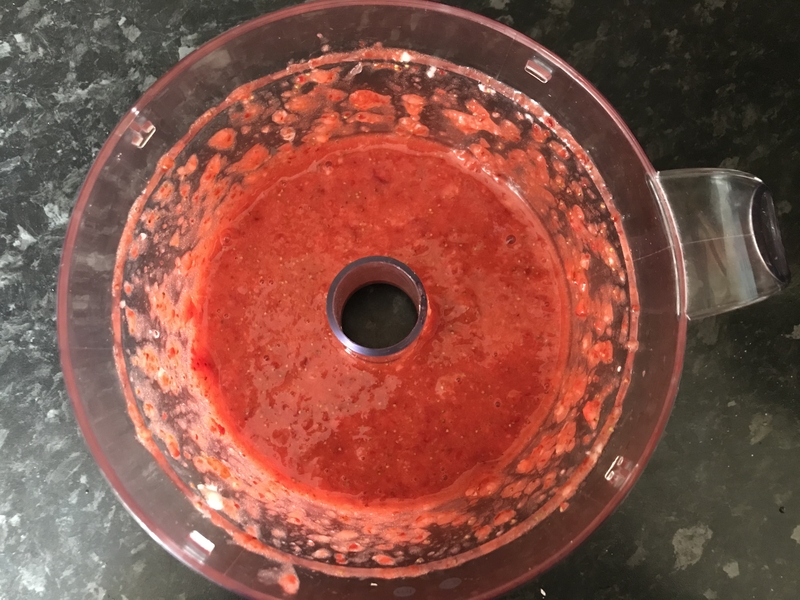 This is not a complaint of course: loads of strawbs and loads of redcurrants mean a kitchen filled with the sweet fragrant fug of boiling fruit and sugar as I bottle up a year’s worth of jam. Need to wait until the baby’s in bed though; I can not even imagine the horror of attempting jam-making with a 9 month old whizzing around under my feet in his baby walker. 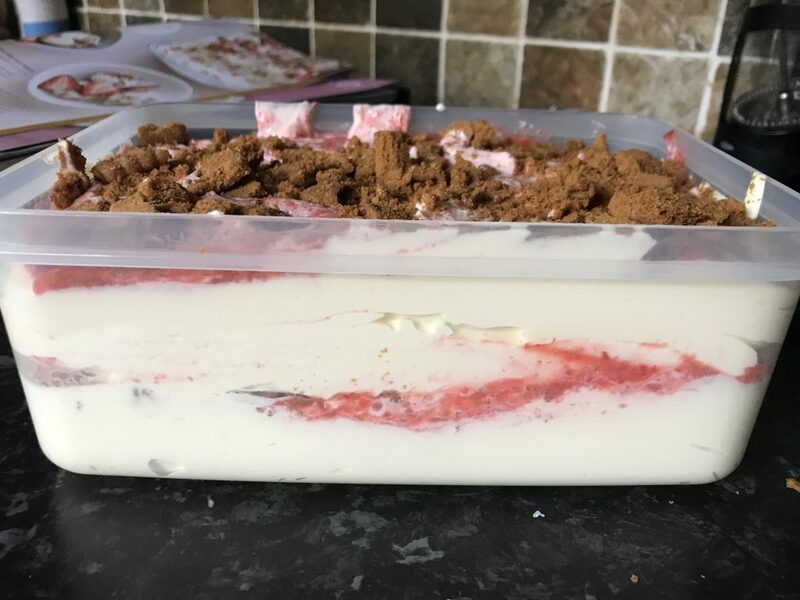 One thing that can absolutely be made with the kids is this no-churn strawberry cheesecake ice-cream, shamelessly pinched from this month’s Waitrose Kitchen magazine. 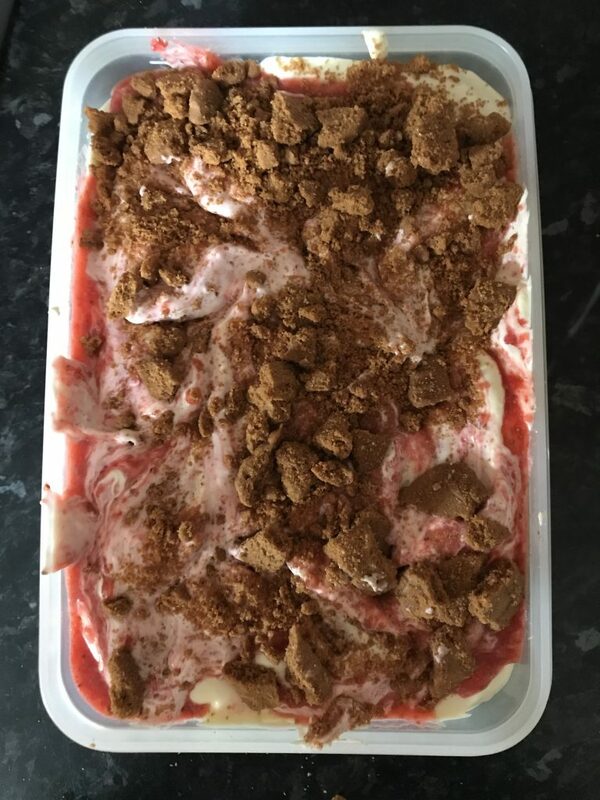 It uses fresh strawberries (anything to get through the glut), those little caramelly Lotus Biscoff biscuits (I get them from the Pound Shop), and a few other store cupboard items that you’ll have lying around anyway or can pick up cheaply enough. There’s no making of custard or boiling of sugar, and no messing around with ice-cream makers, so it’s simple too AND is surprisingly good. First, in your food processor or blender, whizz together 235g strawberries with a squeeze of lemon juice and 1 tbsp icing sugar until smooth. 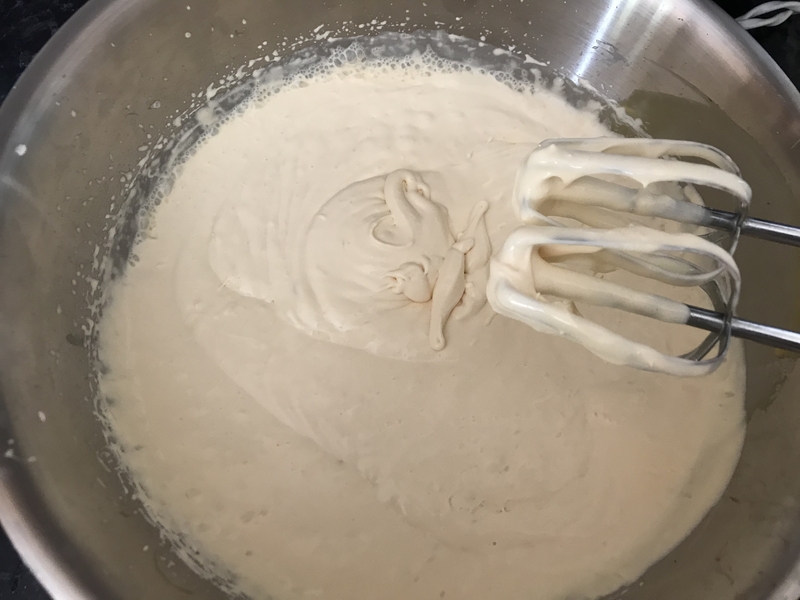 In a largish bowl, using a handheld whisk, beat a 200g pack cream cheese until soft and creamy, then add 1 tsp vanilla extract, a small pinch of fine salt, and a 397g can of condensed milk. Keep whisking until smooth, then add 425ml whipping cream and whisk until thick with soft peaks. 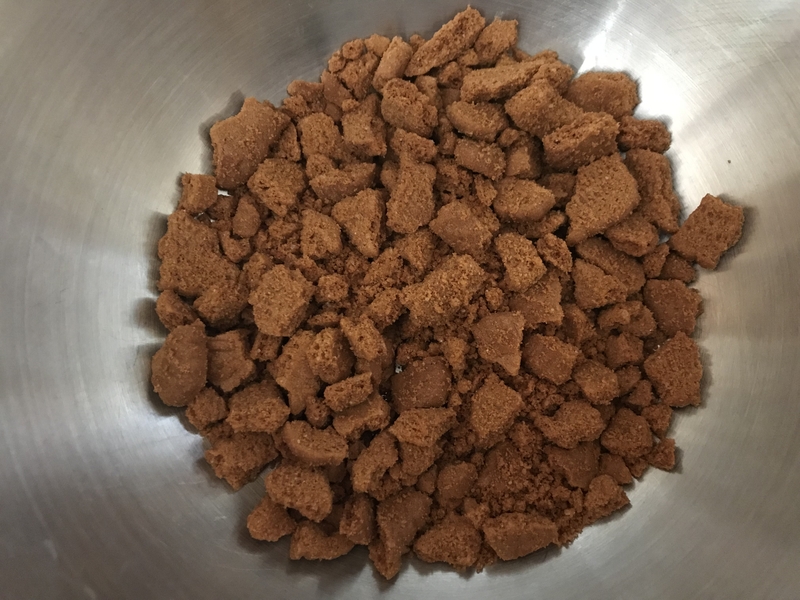 Finally, in a another bowl, crumble up 60g Lotus Biscoff biscuits. I think it’s important to use these as their intense flavour comes through even when frozen, but you could try a different type of hard, caramel biscuit if you can’t find the Lotus Biscoff ones. Then get a tupperware box and fill to halfway with a layer of cream, then fruit and then biscuits. Swirl with a knife to make a ripple effect, then add a final layer of cream, fruit and biscuits. Give it one last swirl with a knife and then put in the freezer until firm, about 5 hours. Once you’re ready to serve it’s best to leave this at room temperature for ten minutes or so to soften. Word up: this is RICH and a little goes a very long way. But it tastes great. It would also work blackcurrant, raspberry or blueberry…always thinking about the next glut, me. Serve with some more fresh fruit on the side to cut through the richness. Also in the garden: Foxgloves are going over but the delphinium and roses are coming into their own. Sunflowers are stunted by the dry weather but beans are romping away. From my desk I’ve been watching newly-fledged magpies testing out their flight muscles whilst still being fed by their parents. Days out: Three Counties Show for Matt’s first Father’s Day and to introduce Harry to his cultural heritage of sheep, cows and men-being-daft-about-old-tractors. David Austen Roses for a cream tea on my birthday. 38 and not out! This entry was posted in Recipes, Sweet and tagged baking, cheese cake, ice-cream, no churn, strawberries, waitress kitchen, Waitrose. Bookmark the permalink.